Agreed. Although I think some might prefer to label it "creative" news. Their goal is to distract. Like a pickpocket, but without the threat of going to jail. They should have a threat of going to jail. 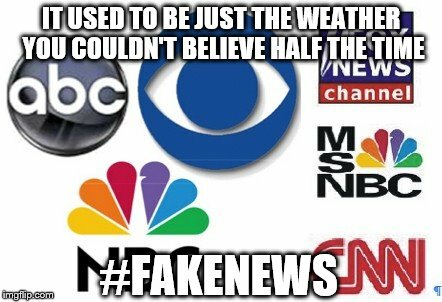 Their reporting has real world consequenses. There was the stock ,market dip when a CBS reporter claimed the Russian soap opera was a done deal and there was proof of collusion. He got suspended for a month but he's back to work and lying by now. They like to think their first amendment is more important than ours because the press is mentioned in the bill of rights. I would almost agree, IF they were doing their job impartially. But a person on a soapbox on a street corner spouting off his bias is not going to have anywhere near the effect the new York times, or CBS evening "news" has with their platform for their bias. Those presstitutes had the dash cam footage in Ferguson. They had a DUTY to inform the public of the true nature of that police stop, not allow a false narrative to fester that ended up with riots, property damage and I am sure bodily damage as well. Who paid for all that rebuild and medical costs? It wasn't the MSM, even though they were responsible. If we cant yell fire in a theater than neither should they. That is exactly what they did with Ferguson and any other number of narratives they push. They need put in a legal box that says You will tell the truth, only the truth, and you will always give opposing viewpoints. I don't think that is too much to ask of our "voice of the people" 4th estate. They are the most regulation pushing industry out there with absolutely none on themselves, not even one forcing them to tell the truth, I think it is time there is. The news outlets sometimes seem bought and paid for by the elite. They have an AGENDA, which keeps them in business.